The Center for Economic Development was recently commissioned to conduct an economic impact analysis for the potential revitalization of the Schell Memorial Bridge across the Connecticut River in Northfield, MA for pedestrian and bicycle use. 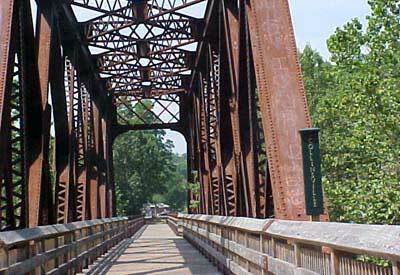 The historic bridge, closed in 1985 due to advanced deterioration of the steel truss members, has attracted considerable attention for restoration due to its scenic qualities, unique architecture and potential linkages to the popular Franklin County Bikeway regional trail system. This report, prepared for Friends of Schell Bridge, a community non-profit organization, represents an important step in the group's efforts to mobilize community and stakeholder support towards the realization of a larger vision for the bridge as a centerpiece for heritage tourism and recreational trail development in greater Northfield. In addition to the study of the bridge's Economic Impacts (authored by Associate Director H. Renski), the CED has also pledged additional lanning assistance to the Friends in their efforts to restore the bridge. As part of this assistance, CED Director John Mullin organized an "Affinity Dinner" at UMass-Amherst in January of 2011, bringing together experts from UMass-Amherst, local residents, and representatives of state and regional planning agencies and executive departments to discuss the complicated issues that must be addressed to move the bridge project forward. The CED recently completed its update of a 2003 study of the economic and fiscal impact of the Springfield Technical Community College (STCC) Technology Park on the region. The STCC Assistance Corporation converted the former Digital Equipment Corporation site into a new Technology Park that houses 40 tenant companies employing approximately 900 workers. In the Fall of 2008, CED faculty began meeting with a group of economic development professionals from the Western MA Economic Development Council and affiliate organizations. This group was interested in improving its business networking functions by developing an information system that can help identify companies with common interests, resources, markets, workforce needs, technological foundations, or other types of complimentary attributes. These commonalities may then serve as a common platform upon which to build future inter-firm partnerships through more effectively targeted business networking events and identify businesses that might benefit from targeted support initiatives: such as new workforce training opportunities, technical assistance programs, or upcoming grant opportunities. Assistance to the WestMass Development Corporation (WMDC). CED has been actively involved in assisting the Western Massachusetts Development Corporation to attract more companies and jobs to Hampshire and Hamden Counties. Our work has involved general technical assistance that focused on land use, design and potential tax relief, provided help WMDC create a stock of potential sites and assisting WMEC to evaluate the revitalization potential of the Michelin site in Chicopee, the Crane site in Springfield and the Ludlow Mill complex in Ludlow. We are currently working on the merits of a "green" industrial park site in Montague. The management of STCC Technology Park desires to determine its economic impact on Western Massachusetts. In order to assess the impacts we propose the following four step process. An Assessment of the Job and Income Multiplier associated with the Park. An Assessment of the Impact of the Spending Pattern for Park Operations. An Assessment of the Interdependence of the Technology Park to the College. Summary: The economic impact component of the University of Massachusetts housing study answered two research questions. What are the direct and indirect economic impacts of the housing industry in Massachusetts? What is the significance of housing as a factor in business location decisions? The first, and primary, question was addressed through a quantitative assessment using the "local impact of homebuilding model" calibrated by the National Association of Home Builders. The second research question was addressed through a qualitative assessment of area development and site selection literature and policy analysis dealing with business location criteria. Summary: This report presented an assessment of expenditures and job multipliers for the human service industry of the Pioneer Valley Region. The study consisted of three parts. Part one was a detailed assessment of expenditures for six human service providers that helped shape a survey of jobs and expenditures. Part two was a follow-up survey that was sent to 110 agencies with a response rate of 53 percent. Part three consisted of the subsequent application of job multipliers, developed by the United States Bureau of Labor Statistics, to the information in order to assess the total impact of jobs to the human service industry on the local economy. The Center For Economic Development at the University of Massachusetts Amherst, housed within the Department of Landscape Architecture and Regional Planning. Copyright 2011 University of Massachusetts Amherst, Massachusetts, 01003. (413) 545-0111.